The universe has been forgetting its own initial state since the Big Bang, a fact linked to the unrelenting forward march of time. Systems that forget where they started are said to have thermalized, since it is often—but not always—an exchange of heat and energy with some other system that causes the memory loss. For example, a melting ice cube forgets its orderly arrangement of water molecules when heat from its surroundings splits the cube’s crystal bonds. In some sense, the initial information about the ice cube—the structure of the crystal, the distance between molecules, etc.—leaks away. The opposite case is localization, where information about the initial arrangement sticks around. Such a situation is rare, like an ice cube that never melts, but one example is Anderson localization, in which particles or waves in a crystal are trapped near impurities. They tend to bounce off defects in the crystal and scatter in random directions, yielding no net movement. If there are enough impurities in a region, the particles or waves never escape. Since the discovery of Anderson localization in 1958, it has been an open question whether interacting collections of quantum particles can also localize, a phenomenon known as many-body localization. 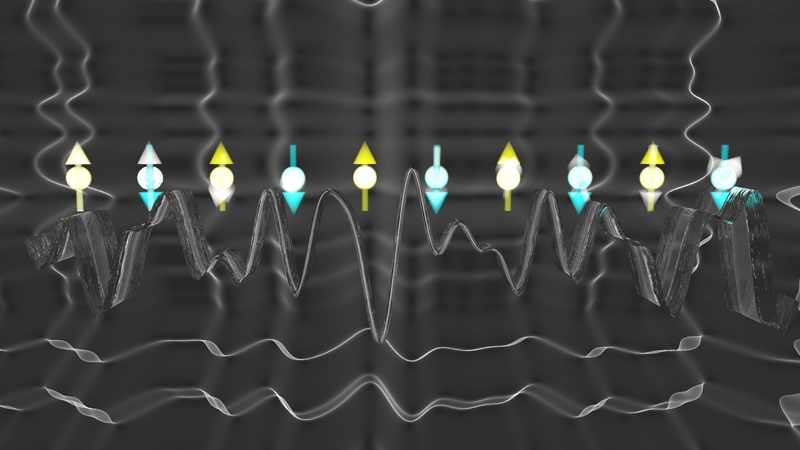 Now, researchers working with JQI and QuICS Fellow Christopher Monroe have directly observed this localization in a system of 10 interacting ions, trapped and zapped by electric fields and lasers. Their findings are one of the first direct observations of many-body localization in a quantum system, and they open up the possibility of studying the phenomenon with more ions. The results were published June 6 in Nature Physics. Although it is possible to simulate the behavior of 10 ions with an ordinary computer, the experiment is an important step toward studying many-body localization with dozens of ions. At that point, an accurate simulation is out of reach for even the fastest of today’s machines. It could also shed light on a question that has vexed physicists since the early days of the quantum theory: When does a given quantum system thermalize? Smith and his colleagues searched for signs of localization by introducing some disorder into a chain of 10 ytterbium ions. The suspicion was that this disorder would act like the crystal impurities responsible for Anderson localization, preventing information about each ion from dispersing throughout the chain. In this case, the information is the initial state of each ion’s quantum spin, a property that makes it act like a tiny magnet. This spin, which can point up, down or anywhere in between, and the ion can absorb and emit photons from a laser, changing the direction its spin points. Lasers with the right color and power also let spins interact with each other in a controllable way. By applying the right lasers, researchers could dial in the strength of this interaction, as well as how far it reached. This controllability is one of the major advantages of studying many-body localization with trapped ions. By focusing a powerful laser to a diameter of just over a micron, the team also applied a random shift to the magnetic environment of each spin, creating the necessary disorder. Then, they tuned the strength of the interactions relative to the size of this disorder and traced the emergence of localization. They performed many experiments with random amounts of disorder, preparing each spin to point either up or down and then measuring all of the spins after a certain amount of time to see where they pointed. Without disorder, the spins rapidly lost any signature of their initial direction. At the end of the disorder-free runs, each spin was just as likely to point up as it was to point down. However, as they cranked up the disorder, the spins started to retain information about their initial state. If a spin started out pointing up, it was more likely to be measured pointing up, and the same was true for spins initially pointing down. This local memory of the initial condition even persisted through the time it took for several spin interactions to occur. In addition to Smith and Monroe, several other authors contributed to the paper: Aaron Lee, a graduate student at JQI; Phil Richerme, an assistant professor at Indiana University; Brian Neyenhuis, a postdoctoral researcher at JQI; Paul Hess, a postdoctoral researcher at JQI; Philipp Hauke, a postdoctoral researcher at the University of Innsbruck; Markus Heyl, a researcher at the Technical University of Munich; and David Huse, a professor at Princeton University.